480 pages | 44 B/W Illus. 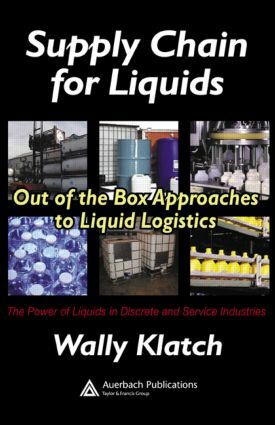 Supply Chain for Liquids: Out of the Box Approaches to Liquid Logistics provides a thorough analysis of liquid logistics, a crucial but often overlooked business issue. It covers a broad range of topics including the business, operational, and technical aspects of the Supply Chain for Liquidsâ model, allowing readers to leverage the inherent properties of liquids toward business success. This volume details an approach that is justified based on both business and social/environmental value, offering a groundbreaking "how-to" guide for revolutionizing logistical operations and increasing competitive advantage. It challenges traditional thinking, enabling businesses to identify new ways to maximize efficiency and profit. "Supply Chain for Liquids is fun to read. Wally draws from his extensive liquid-products experience, as both practitioner and consultant, to entertain the reader with amazing stories while instructing the reader on the practicalities that maximize the financial return in a liquid-products business. Every supply chain network uses some form of liquids, and many supply chain networks are true hybrids, planning and controlling equal proportions of discrete and liquid products. Wally's point of view is so fresh that it is fair to say that this book offers something worth learning for every supply chain professional." Why Supply Chain for Liquids?